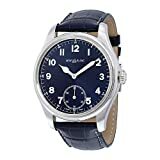 Montblanc 1858 Blue Dial Blue Leather Mens Watch 113702 – Worldwidewatchco. Stainless steel case with a blue alligator leather strap. Fixed stainless steel bezel. Blue dial with silver-tone hands and Arabic numeral hour markers. Minute markers around the outer rim. Dial Type: Analog. Small seconds sub-dial atthe 6 o'clock position. Hand wind movement. Scratch resistant sapphire crystal. Case diameter: 44 mm. Round case shape. Water resistant at 30 meters / 100 feet. Functions: hour, minute, second. Luxury watch style. Watch label: Swiss Made. Montblanc 1858 Blue Dial Blue Leather Mens Watch 113702.